For so many of us removing unwanted fat and trying to lose inches from our bodies has become a source of endless frustration. Perhaps you’ve spent hours exercising, targeting different areas of your body and yet aren’t seeing the results you desire. Zerona Canada is a company who knows exactly how you’re feeling, they’ve developed a new non-invasive body sculpting procedure designed to remove fat and contour the body without invasive surgery. Sounds like the magical answer doesn’t it? 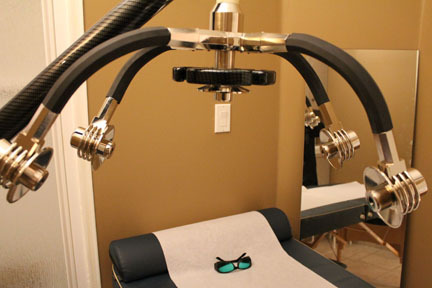 Zerona Canada’s cold laser treatments are approved by the FDA and Health Canada and provide a much less invasive than other choices such as lyposuction. Zerona doesn’t eliminate the fat cells. The treatment actually zap the cells with cold laser which creates a hole or pore in the fat cell. The pores allow the junk from within the fat cell to be eliminated and flushed out of the body. Essentially Zerona essentially detoxifies and flattens the fat cells. Zerona Canada was kind enough to allow Julie from SoberJulie.com to tour 2 of their facilities and undergo one treatment to be able to share her impressions with you all. Julie felt the offices were clean, welcoming and staffed by friendly, certified representatives. She was told in advance to ensure she was well hydrated and that she would be dressed only in her bra and underwear for the treatment. Julie was measured from multiple locations over her body, weighed and an analysis was performed of her hydration, fat percentage and other factors. Julie was told to lie down and get comfy, for a blissful 40 minutes she lay under the laser in a quiet room. The experience was relaxing and comfortable. Following treatment Julie was measured in exactly the same locations which the lady had marked on her body. She had lost 6 inches over my body, 2 of which were from the largest part of her abdomen! The results speak for themselves, Zerona worked for Julie and now I’m pleased to be sharing the new with you all! If you’d like to connect with Zerona you can find them on Facebook or Twitter and they have many reviews available to you on their website and blogs. Why: Let’s talk about rapid inch loss, you know you want answers! Prizes: Open to residents of Canada, prizing to be announced but you’ll be pleased! RSVP: Provide your Twitter profile name and url in the link below. How do you do a twitter party? I’m on the list. Do I just go to the hashtag at 9 PM? Never done this before. Don’t know what I’m doing. Just guessing as I go along.